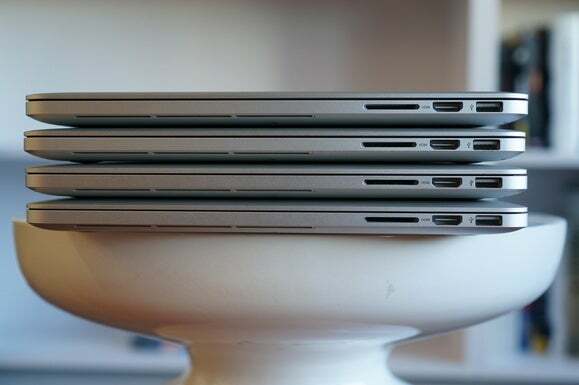 Apple hasn't made any major design changes to its flagship laptop since 2013 and it shows. If comedian Henny Youngman were alive today, I’m sure he’d have a routine on the MacBook Pro 15: “How old is the MacBook Pro 15?” It’s just begging for a one-liner. Unfortunately, the punchline is no joke. The MacBook Pro 15 design is old. I mean, old. Don’t believe me? 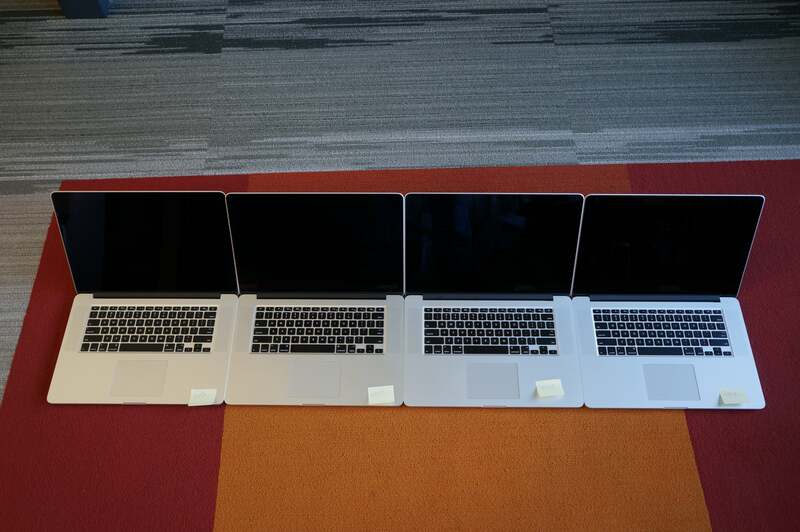 I collected a stack of MacBook Pro 15’s from around our office as well as a brand-spanking-new MacBook Pro 15 purchased by our company just this week to assess the laptop’s evolution. The lack of change is jaw-dropping. 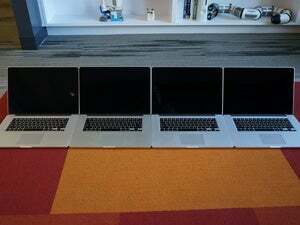 If I took all four MacBook Pros produced between 2013 and 2016 and shuffled the stack, even a die-hard Mac fan could not tell the difference. Just see the image below. From bottom to the top: the MacBook Pro 15 (2013), the MacBook Pro 15 (2014), the MacBook Pro 15 (2015), and a brand-new, bought-this-month MacBook Pro 15 (2016). But surely the ports are different...right? When I showed the stack of MBPs to a local fanboy, he said, “Well, the ports are different.” Oh? Let’s find out. 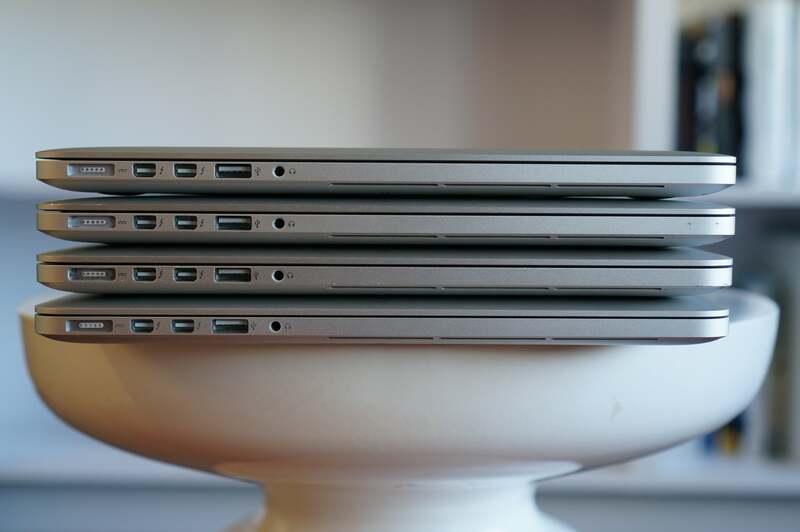 Despite the rise of many new standards over the years, today’s MBP 15 has the same ports as the one sold in 2013. Nope. Since 2013, we’ve seen USB 3.1 10Gbps over Type A, USB-C, and Thunderbolt 3 bubble up. But on the MacBook Pro 15, you’d think time had frozen. Yep, the other side’s port situation is just as static. Some would call that phoning it in. In Apple’s case, that’s iPhoning it in. Internally there have been changes, but not what you’d expect. Our 2013 model features a 3rd-gen quad-core Intel CPU with a GeForce GT 650M GPU. The CPU and GPU didn’t actually change much from the 2012 model, but the 2013 model did do away with the optical drive. With the 2014 MacBook Pro 15, Apple introduced a 4th-gen Haswell quad-core chip, and our particular sample has Intel’s Iris Pro graphics. What’s amazing is that it’s been pure cruise-control since then. Our 2015 MacBook Pro 15 uses the same basic 4th-gen chip with Iris Pro graphics. As for the model my company just shelled out good money for this week, it too isn’t much different from the 2014 model except for the addition of a Force Touch trackpad. Yes, Apple has made more significant changes to graphics options over the years. The MacBook Pro 15 from 2013 had a GeForce GT 650M option, the 2014 moved to GT750M, and the current MacBook Pro 15 offers a Radeon R9 M370X. But again, these are options. For the most part, if you went out to buy a stock MacBook Pro it wouldn’t have significantly faster graphics performance than one from two years ago. Storage might be the only area where the term “upgrade” actually applies to the 2015 model, which has 2.5 times the SSD performance of its predecessor. On the PC side, of course, we’ve seen massive advances. Pascal-graphics, Skylake and Kaby Lake CPUs. DDR4. G-Sync, 4K, and OLED panels. Individually backlit keys, external graphics, and more. I had to label all of the MacBook Pro 15’s because I could not tell them apart otherwise. Granted, PC OEMs have been known to practice a similar holding pattern. 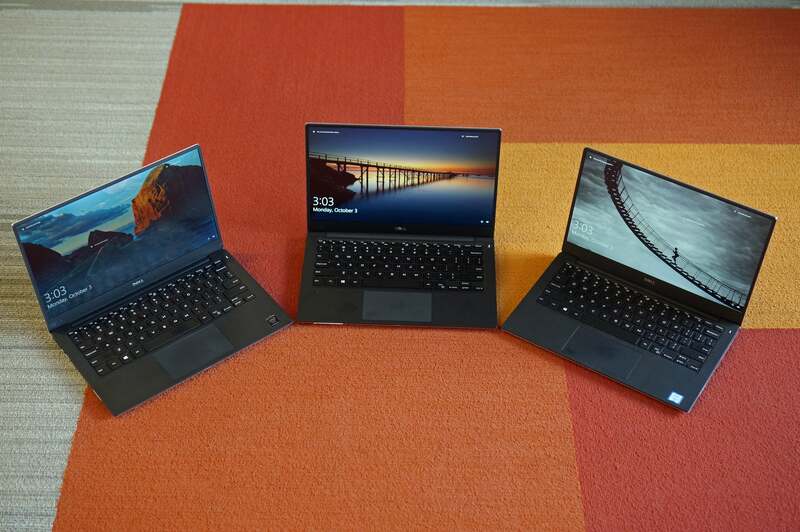 The current-generation XPS 13, for example, is pretty similar to the last-gen model. And you can argue that once you’ve hit a great design, why change it? 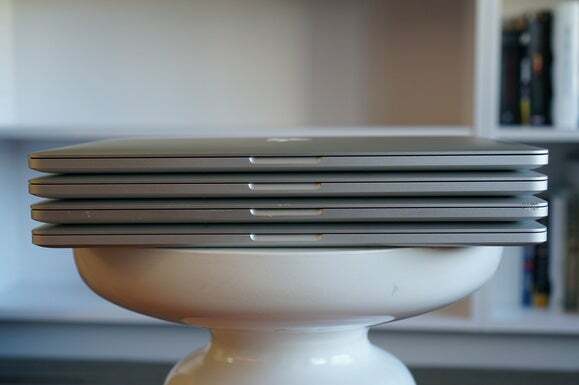 I can tell the the difference between the last three iterations of the Dell XPS 13, but most people could not. Still, Dell’s upgrade curve is far more aggressive than Apple’s. The XPS 13 was introduced in 2015 and it has already gone from 5th- to 7th-gen CPUs, plus added Thunderbolt 3 and USB-C charging in that time. The latest XPS 13 is also from 20 percent to 25 percent faster than one from 2015. 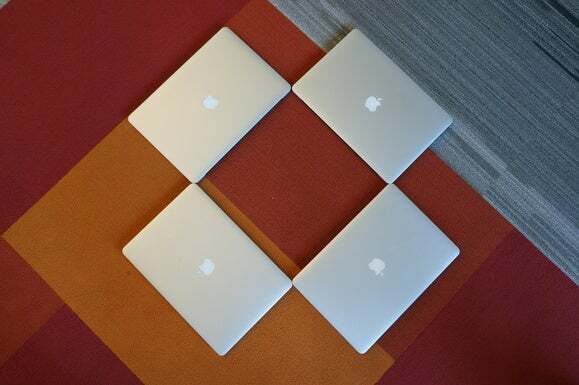 The MacBook Pro? Well, let’s just say the upgrade that’s rumored to be coming later this month is long, long—long—overdue. I can easily predict what will be inside: I just have to look at what PC vendors have been doing for the last 24 months. Frankly, I welcome and look forward to the new MacBook Pro 15, if it actually bothers to show up.